Right now, the Harmony Ultimate is $119.99 at Best Buy, which is an all-time low. The remote has a color touch screen with vibration feedback and motion-activated backlit buttons. 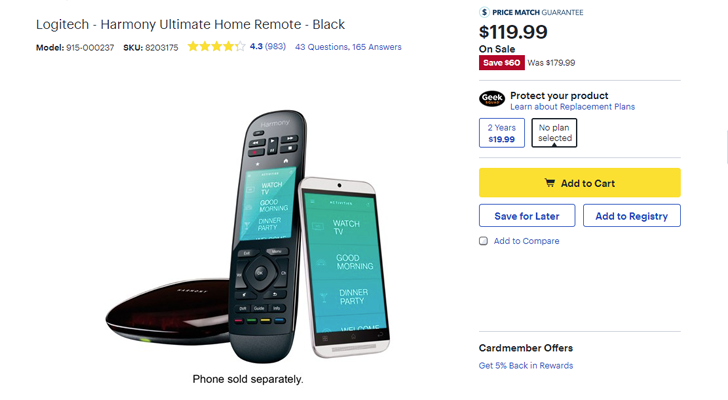 This isn't the latest Harmony remote, but it's still a good price for all the functionality you get. Android and iOS apps are also available, so you can use your phone as the remote. The Harmony devices use their own hubs for communicating with smart home devices, so keep that in mind if you plan on buying one. A full list of supported devices can be found here. You can buy the remote from the source link below.